You'll be £30.00 closer to your next £10.00 credit when you purchase The Great War Illustrated 1918. What's this? The final book in a series of five titles which graphically cover each year of the war. Countless thousands of pictures were taken by photographers on all sides during the First World War. These pictures appeared in the magazines, journals and newspapers of the time. Some illustrations went on to become part of post-war archives and have appeared, and continue to appear, in present-day publications and TV documentary programmes - many did not. The Great War Illustrated series, beginning with the year 1914, includes in its pages many rarely seen images with individual numbers allocated, and subsequently they will be lodged with the Taylor Library Archive for use by editors and authors. While some of the images in The Great War Illustrated 1918 will be familiar, many will be seen for the first time by a new generation interested in the months that changed the world for ever. Add this book to the others in the series and you have the most comprehensive photographic record of WWI. This has been a fantastic series of books and this last volume has maintained the standard from first to last. An impressive documentary work that cannot be missed in our library. No student, historian or military professional can afford to be without this unique collections of images, many of which are extremely rare. 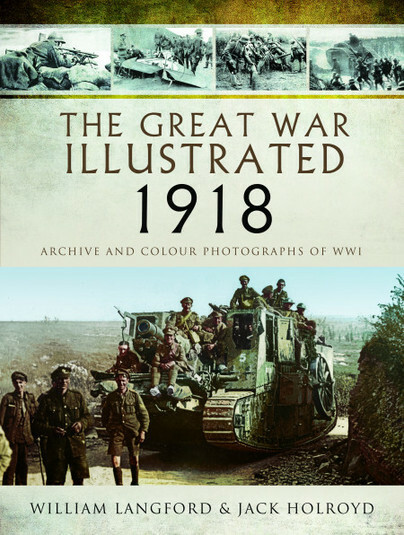 In sum, this is a book for people interested in WWI (the whole collection is) at a personal level, invaluable for researchers, as it provides a good reference to a large body of archival images, and it is packed with bite-sized information that will provide inspiration to many writers and scholars. Another great addition to Pen & Sword military catalogue and one that I thoroughly recommend. This 517-page book’s imagery and the writers’ narrative combine to succeed in fostering understanding of the events pictured and the global scope of the epic conflict which climaxed 100 years ago. Overall, monarchies fell, and the map of the world changed. Having suffered the ravages of global war, the world was a harsher and more violent place, and worse was to come. This is a very worthy book for anyone’s collection, whether they are interested in the Great War, photography, or simply history in general. Add this to the other 4 volumes in the series, over 5,500 archive photos make a valuable reference to the history of WW1 and with informative captions provided for them all by experience historians this is a fine series, and this final volume covering 1918 rounds it all off very neatly.